Explore the sacred sites of Santiago and Viana on this full-day private tour, departing from Porto. With your expert guide by your side, travel to Santiago de Compostela in Galicia, Spain, and learn about why this is one of the most important Christian pilgrimage routes in the world. 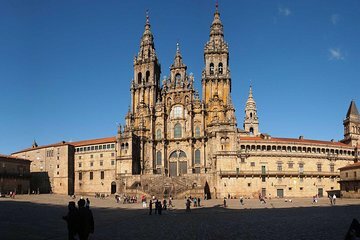 Witness the wonder of the Cathedral of Santiago de Compostela. Then, head to the Old Town, a UNESCO World Heritage Site. On your way back, stop by Viana do Castelo, in Portugal’s Minho province, to see the views from the Hill of Santa Luzia.